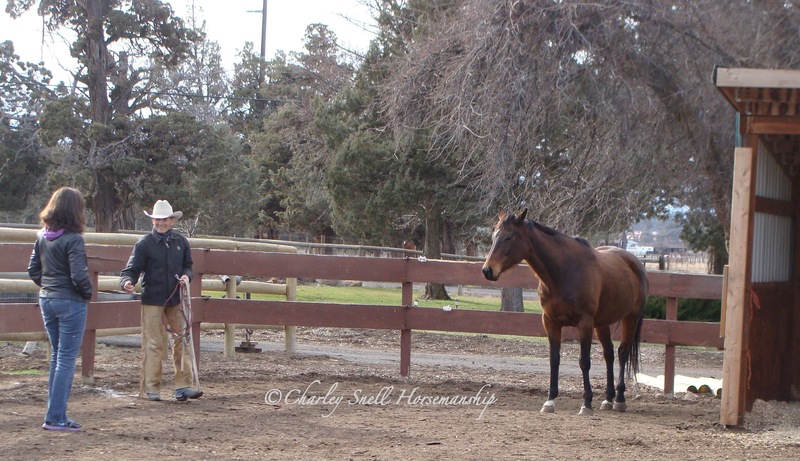 In this new four-part series on horsemanship, Charley Snell and his mind-of-her-own mare, Belle, spend a blustery Central Oregon afternoon with Eileen Chambers, showing her the significant advantages of using a fence or raised platform when working with a horse. Tell me how Belle came to be with you? Were Legolas and Star getting a little lonely or something? Because Legolas is getting older and a bit stove up, I started looking for another horse to ease his workload. When I heard that Belle was a give-away, you could say I had a relapse of Eastern Montana cowboy mentality. Meaning, “free?” I’ll take her. When I got Belle, I started seeing some intriguing things to work with. For example, she travels with an uncommon stiffness of gait for such a young horse. So I thought it would be interesting to see if I could improve that some. 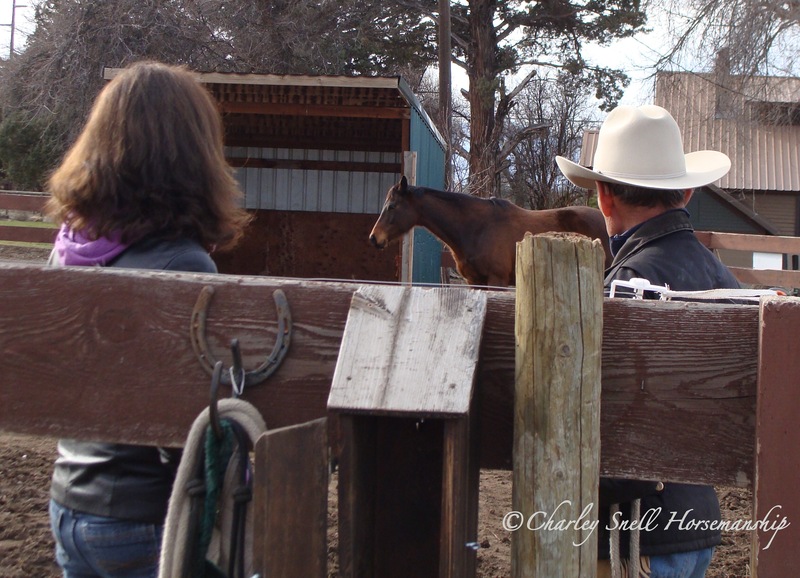 Often the problems we see in a horse come directly from how they were treated or trained on when they are young. This mare has some of those things going because this started when she was a baby. When someone doesn’t know how to get a horse with them mentally, then the human usually ends up doing something to manipulate the horse, such as running it around and around in the round pen or trying other things that do not suit the horse. Like trying to pick up its feet. 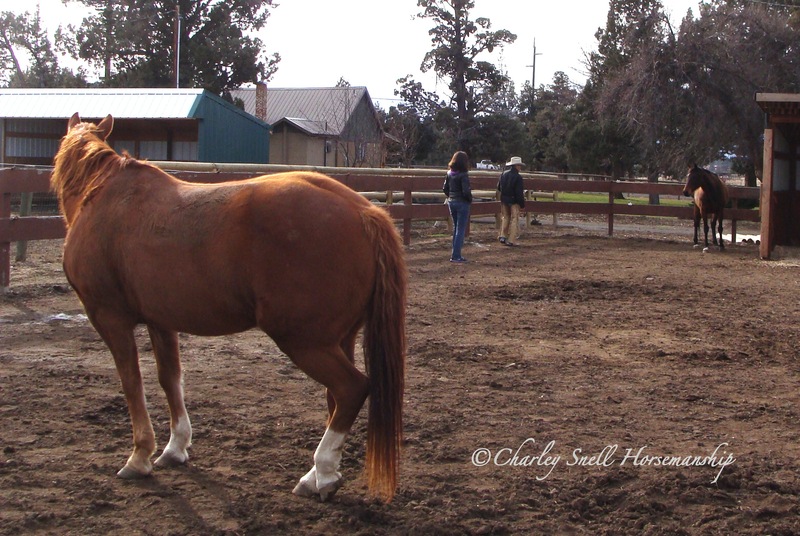 When I work with a horse, and sometimes it does not take too long, it will be doing what I want because I have gotten the horse to connect with me mentally. Belle standing as we step into the paddock. Here in the paddock, she seems to be giving us the brush-off. Belle of the Ball, huh. 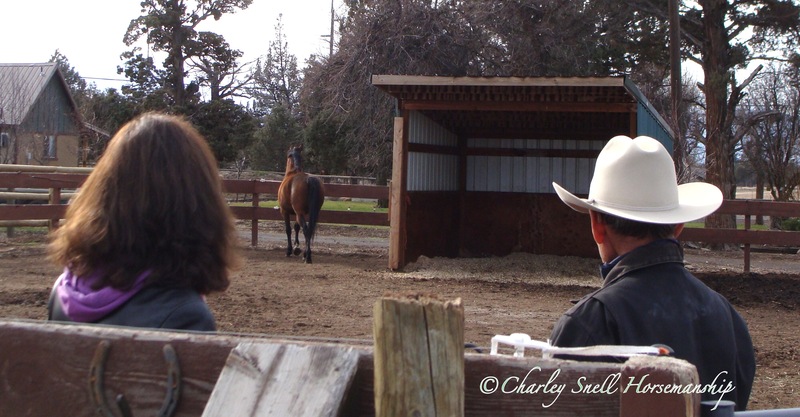 When I go into my pen to catch my horses, I pay attention to what everyone is thinking and where they are at mentally. Now, when we walked in, Star, there on the left, took everything in and started to come over here. She decides on her own agenda. Belle, however, headed off to the other side. In other words, she was saying to us, “Well, you are not that interesting. I don’t need to be there with you.” Her mind was off thinking about something else. Now, you could go catch Belle while she was standing perpendicular or with her back towards you, but if you did, then you would have already created a situation, right from the start, where she was not with you mentally and will you teach her to be that way. Totally not interested in us. Now think about it. If your horse is not respecting or responding mentally to you here in the paddock, what makes you think that if you rush in and get on her back, that she won’t shut you out and do exactly what she has been doing all along – from the moment you first walked into the pen? No. No. I won’t tolerate walking into my pen and have one of my horses say to me, “Up yours.” That would be equivalent to a child getting up from the dinner table without permission and, although you address him for his behavior, he continues to walk off ignoring you. This mare walking off reminds me of that thing where a parent will speak to a child a half dozen times with no response and then they end with you shouting and maybe even threatening the kid. Doesn't work that way in my house. Even as we start to approach she has her preoccupations. So getting a horse with you mentally from the get-go is really important. Yes. From the start, school is in session. Right from the get-go. I do not put my halter on a horse until I have them in the frame of mind of being with me. But the key distinction here is that I am not demanding that she pay attention. She has made a small change. What I am doing is trying to fix it up so that Belle makes the decision herself to be with me mentally. So, as I approach, I begin to offer things so that Belle can choose to be here with me. When she turned and looked at me again, I offered her a little thing. Eventually, her expression began to change and, when it did, then I caught her—and away we went. She is now actually trying. Note Star is connected to us. If I had just walked in there, not paying attention to her sorry expression of “I am not paying any attention to you. I am not thinking about you. You really don’t even exist,” then what would I have taught her? I would have taught her that I don’t exist and that she can continue to have that attitude about everything. You know, there is nothing worse than one human being deliberately ignored by another. What they are saying is that "you have no value". Everyone has value, that is a given. When her expression and hindquarters are all lined-up, indicating that she is with me mentally, then she is ready to be caught. Again, I would not put my halter on one of my horses unless they were in this frame of mind. It’s that important to me. You said this is about fixing things up so that the horse makes the decision to be with you. What decision were you offering Belle? As we stop to chat Belle comes thru real nice. I was offering her this; that I am a good deal and that she can be around here and maybe we will do something together. That was the decision that I offered her. 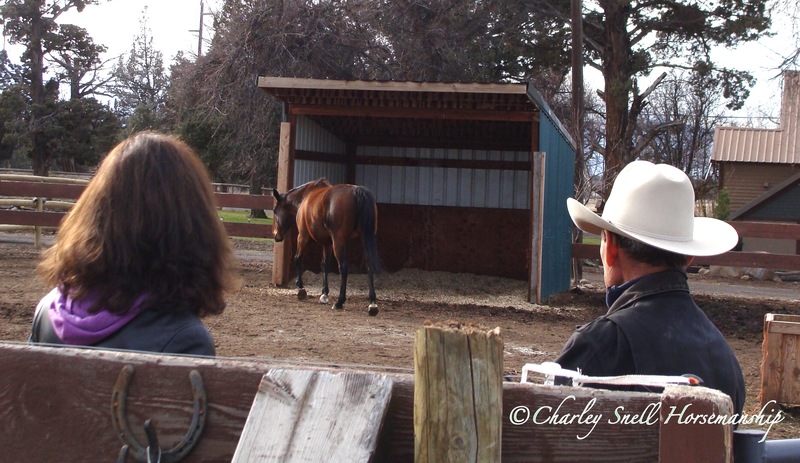 From the start, many people just chase their horse down in the field or paddock, not thinking about what they are doing. 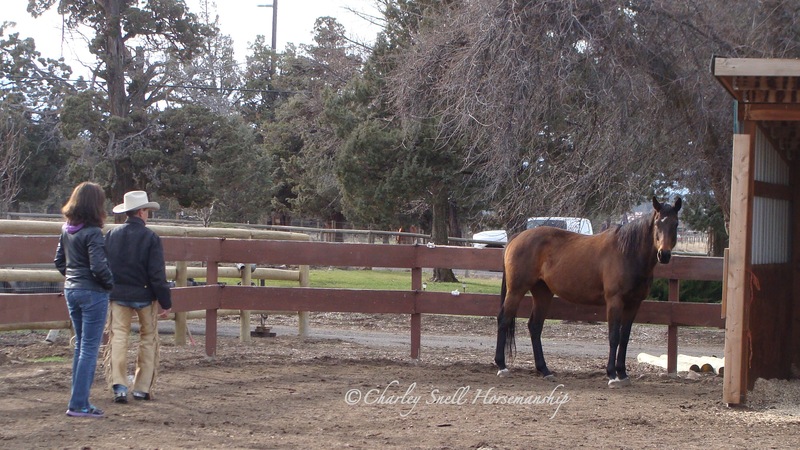 If you halter your horse with it thinking about something out there and not you, you shouldn’t be surprised at what happens in the round pen or when you are on its back. So whatever I do, I set it all up so that my horse is thinking about me right from the very get-go. She is totally agreeable to being haltered. Okay. She’s haltered. Now what? When I get ready to go, my expectation here is the same thing, meaning that she should stay with me mentally. When we go out the gate, if she is with me, the lead rope should not come tight and her hindquarters should line up. Belle should have come out in a ¾ circle and stayed more lined up to me. But she left me about halfway in the circle, indicating that she had some ideas going out there. If I had turned her loose, she would have walked off. So, are you saying that a horse should be lined up with you head to tail at all times? Depending on what I am asking them to do. For sure. Part Three - Talking "Horse"